Classroom scene with lecture and slide show on Soviet Strategic Defense Forces, followed by an extensive question and answer session. 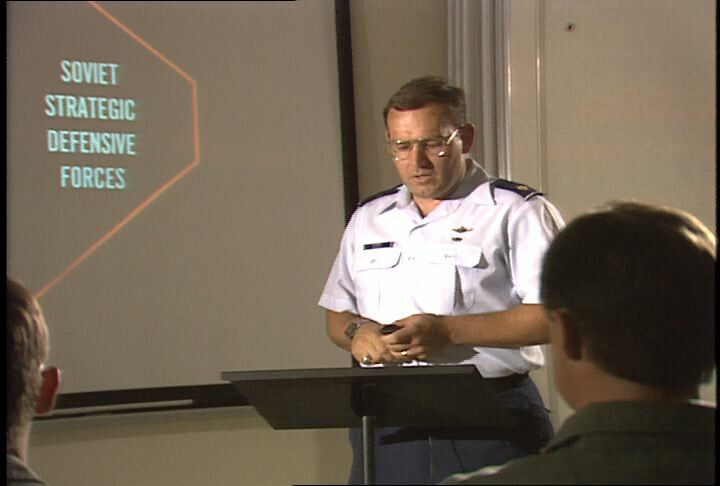 Chicago: “War and Peace in the Nuclear Age; Air Force Class on Soviet Threat Awareness,” 05/28/1987, WGBH Media Library & Archives, accessed April 20, 2019, http://openvault.wgbh.org/catalog/V_7553A40E33364FC8B76A50AC43D19315. MLA: “War and Peace in the Nuclear Age; Air Force Class on Soviet Threat Awareness.” 05/28/1987. WGBH Media Library & Archives. Web. April 20, 2019. <http://openvault.wgbh.org/catalog/V_7553A40E33364FC8B76A50AC43D19315>.